While I was thinking today about the pig situation, I started to think about all the uses of the pork - from bacon and sausage to pork chops and roasts. Then my mind started to wander to this yummy stuffing that my family LOVES. I know it's not necessarily the time of year to post about stuffing (I guess Thanksgiving time would be more appropriate) but I figured who cares! This recipe is worth posting any time of the year because it's that good. I first came across this recipe a couple of years ago. At the time I had never made homemade stuffing from scratch and the combination of apples and sausage in a stuffing sounded so good I knew I had to try it. Needless to say it was a big hit in our house. 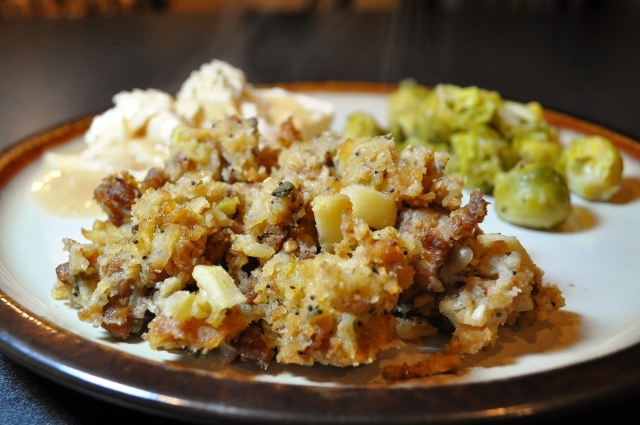 All of us thought it was the best stuffing we've ever had, and it has since become my go to recipe for stuffing. I have tweaked the original recipe to my own preferences and the result is a keeper. No need to wait for Thanksgiving - I make this as often as possible because none of us can get enough of it! Coat a large sauté pan with olive oil over medium heat. Add the onions and celery, and season with salt. Cook until veggies start to become soft and translucent. Add the garlic and cook for another 1-2 minutes. Add the sausage and cook until the sausage browns/cooks thru. Stir in the apples and apple cider and cook until the apples start to soften, about 3-4 minutes. Sprinkle in the sage leaves and turn off the heat. Preheat the oven to 350 degrees. Add the diced bread and toss together. Pour in the chicken stock and knead with your hands until the bread is very moist (you want it to be pretty wet). Taste to check for seasoning and season with salt and pepper if needed. Transfer to a 9x11 deep ovenproof dish and bake until it is hot all the way through and crusty on top. Serves about 10. I've made this recipe for the last 5 years for Thanksgiving. It's a big hit every time! Thanks for posting it. My family loves it!! !